A drunk man who confronted a heavily pregnant woman with a meat cleaver has been jailed. Emma Nash found the defendant Ryan Richards stealing from her BMW in New Broughton, Wrexham county and he ran towards her with the weapon. He then produced a hammer when her partner intervened. Richards, 43, admitted the offences and was jailed for two years and eight months. 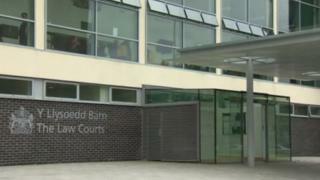 Mold Crown Court heard he was responsible for a string of offences on 13 October this year, including a burglary, theft and possessing a blade and a hammer as an offensive weapon. The burglary took place at a house in New Broughton where Richards stole a woman's purse while she slept. He then stole items from Ms Nash's car. Her dog grabbed him by the sleeve and her partner managed to overpower him and pin him down until the police arrived. Richards, who had been working as a self-employed plasterer, told the court he could not remember anything of the incident after he had taken alcohol and sleeping tablets.